The Trijicon ACOG is renowned for its accuracy and durability but it appears there's a new kid on the block; the Leupold HAMR. We will be comparing the TA31RCO and the Mark 4 HAMR both fixed four power scopes. 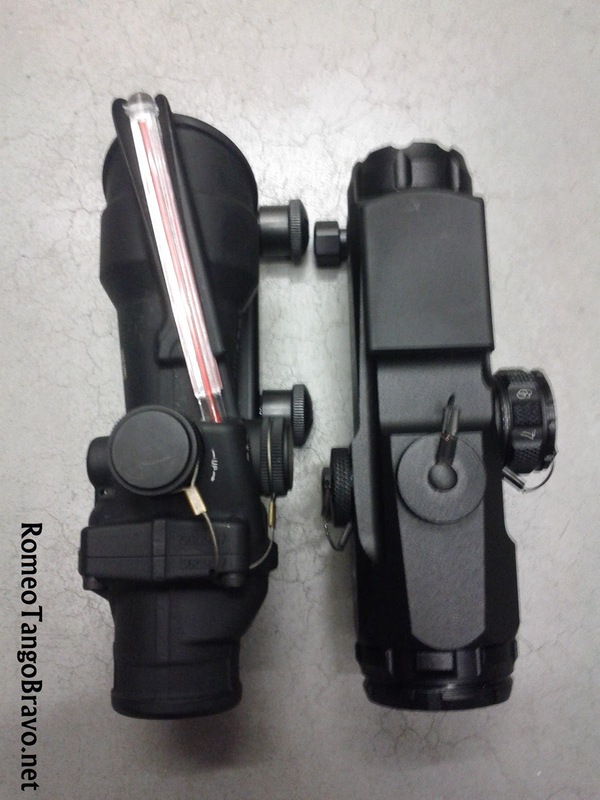 The HAMR (5.5") is nearly two inches shorter than the ACOG (7.2") when it has an Anti-Reflective Device (ARD) attached. Without the ARD the HAMR is still shorter. 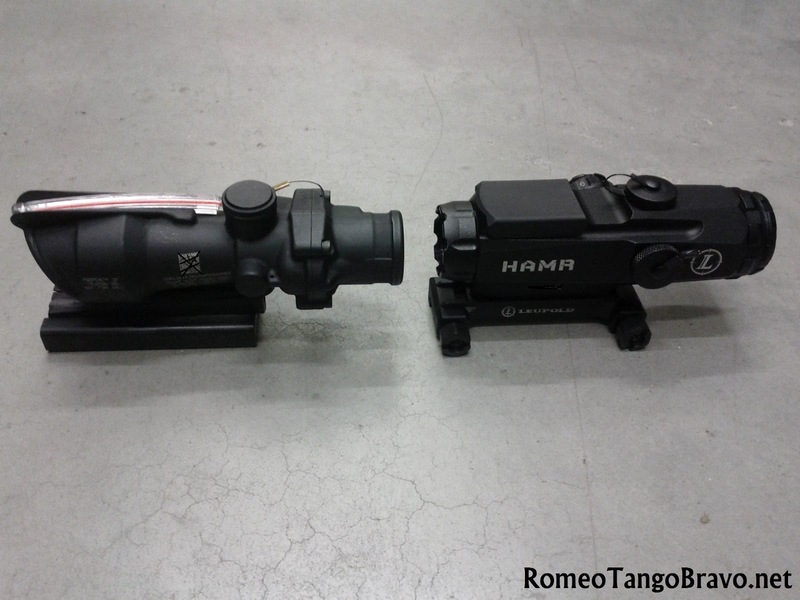 Being shorter; the HAMR is also lighter being 13.1oz compared to the ACOG's 16.2oz. Three ounces may not seem like alot but ask anyone who has had to do any lengthy dismounted patrol; you begin looking at your weapon and thinking about what you can get rid of or change to lighten it. The HAMR is powered via a standard CR2032 I'm unsure of run time which will always vary depending on usage and power setting. The ACOG is powered by two different sources. The first is the fiber optic rod that is position on the top of the optic. The fiber optic will keep the reticule illuminated with ambient light. The second source is Tritium also known as Hydrogen-3. Being radioactive as it decays it gives off a glow that is visible in the dark and illuminates the reticule in the absence of light. Due to Tritium's nature its importation is restricted into several countries which has prompted Trijicon to develop the battery powered ACOG LED. 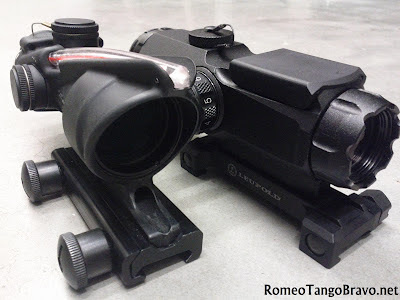 Both optics utilize a 'Bullet Drop Compensator' that is useful during long engagements. Many folks complain that the markings in the ACOG are too small; while the HAMR is more defined but just as precise. 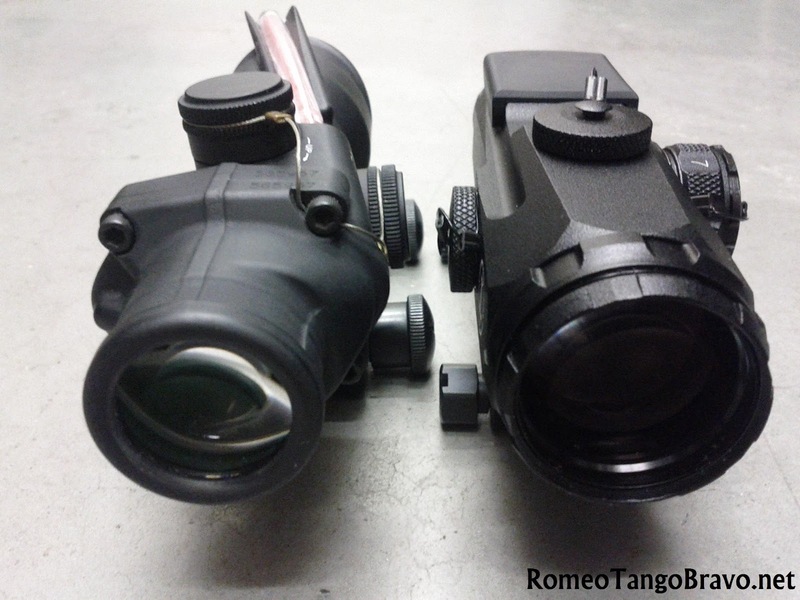 The FOV between the two optics are very similar. The ACOG boasts 36.8' at 100yds while the HAMR provides 32' at 100yds. With the exit pupil being 8mm with a 32mm objective lens you can see where the ACOG has a light advantage. 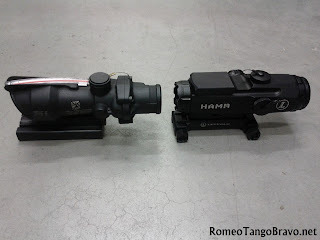 The HAMR has a 6mm exit pupil with a 24mm objective lens. The HAMR really shines when it comes to eye relief. 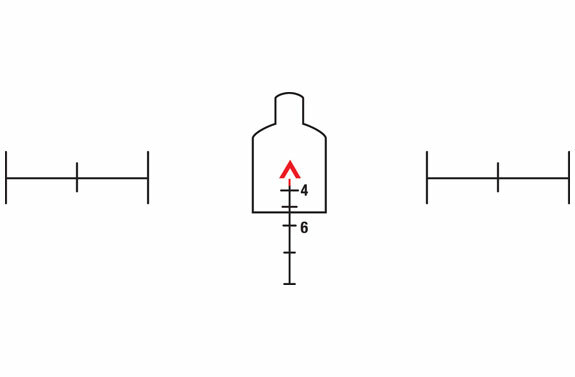 Anyone who has used an ACOG immediately notices the low eye relief that it offers. 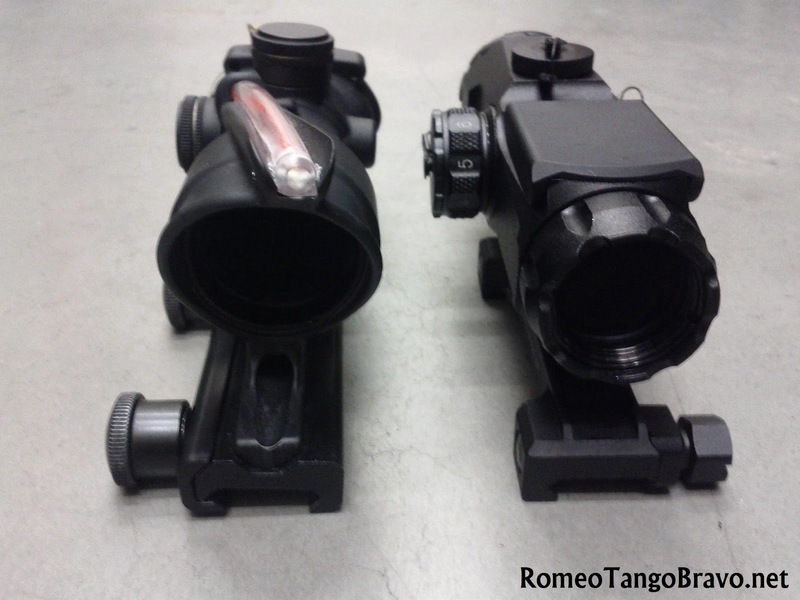 The ACOG as a 1.5" eye relief compared to the HAMR's generous 2.71". What is eye relief and why is it important? It is the distance between the ocular lens and your eye that provides you with the proper viewing angle to achieve the correct sight image. If you have a longer eye relief this allows for more mounting options and a bit more room to achieve the correct sight image. Both the HAMR and ACOG offer an option to mount a Mini Red dot (MRD) to the main optic. 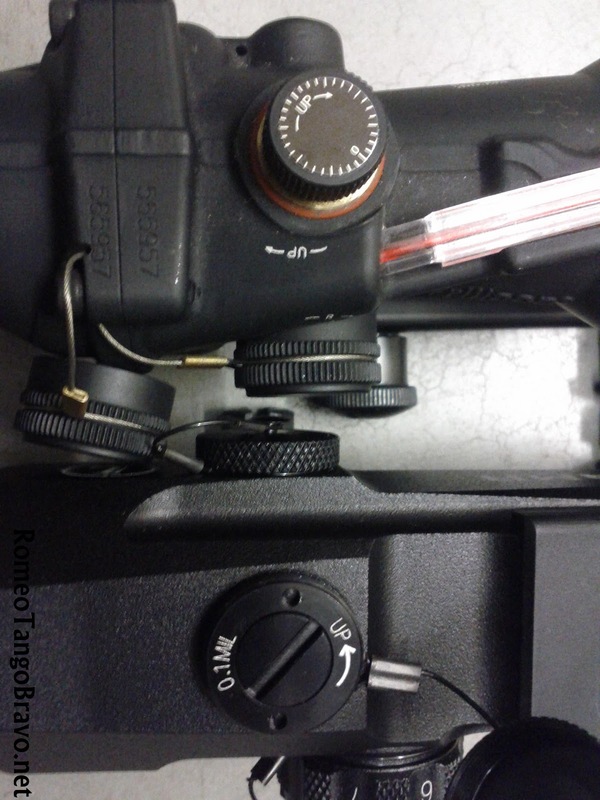 Leupold manufactures the DeltaPoint that connects to the HAMR via the built-in, proprietary mount near the front of the scope; above the objective lens. Trijicon manufactures the RMR (Ruggedized Miniature Reflex) that mounts above the ocular lens at the rear of the scope. I've owned an ACOG for several years and sold it too a buddy that was headed for Afghanistan. I would really like to replace it with a HAMR. Both are similarly priced so I will be saving my pennies for a while. great read! i've been wanting some side by side comparison. now i just need some cash for an epic optic.